Samsung is reportedly working on not two, not three, and not four Galaxy S10 models, but a grand total of five variants of the company’s next flagship smartphone, including a GS10 Lite expected to settle for a relatively small battery and flat 5.8-inch screen. Multiple benchmarks of unspecified prototypes featuring the same motherboard have been associated with Snapdragon 855 reference devices over the past couple of months, so it’s pretty much etched in stone now that the Samsung Galaxy S10 Lite will come equipped with Qualcomm’s powerful new SoC. Oh, and in case you’re wondering, the aforementioned SM-G970U model number is clearly related to the SM-G960U label attached to the Galaxy S9. The “regular” Galaxy S10 is rumored to carry an SM-G973 model number, with the S10+ also known as SM-G975 on the inside. The letter U at the end of the phone’s designation, by the way, strongly suggests this will be sold unlocked in the US. As for the actual benchmark scores of the Galaxy S10 Lite, they’re certainly not impressive, especially if you compare them to the alleged recent results of the Sony Xperia XZ4. That can be partly explained by a difference of 2 gigs of memory between the two devices, as well as a likely gap in the pre-production process. We’re guessing the SM-G970U prototype tested earlier today is far from finished, running unpolished (Android 9) software. 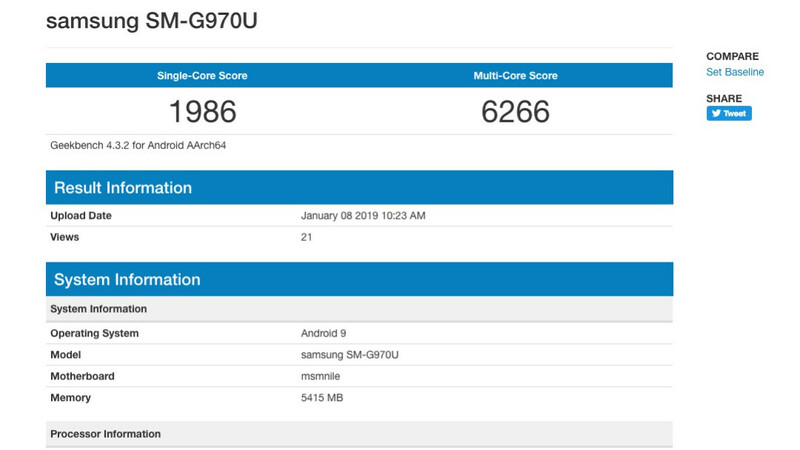 After all, even the Galaxy S9 is capable of posting higher single and multi-core scores than 1986 and 6266 with a Snapdragon 845 processor. Do you already have wide 5G infrastructure in India? No, we don’t have it in large scale like US but I've read that small testing centre's have been prepared to simulate the real world usage where testing will begin after H1 of 2019. Full rollout likely in 2020-21. This time government is trying to roll-out 5G at rate on par with the West. With that said it's foolish to think Samsung will bring 5G Galaxy to India in 2019. There is no 5G infra yet in India. Lol, so Abhicool wants a feature he won't be able to use for a while. It's all about the bragging rights. No one should buy a 5G phone in 2019 unless you have the disposable cash to do so. If the S10 Lite will be 7-8mm shorter than the S9 and it will have the S10 main camera then it will sell like hot cakes even with an inferior processor, as long as the battery endurance is good. A modern compact flagship is sorely needed. The S10 won't be compact with that 5.8 inch display. Atleast not compared to the current Samsung phones.